Meetings International Conferences provides opportunities, revealing oodles of unique ways you can reach your prospects through our many events and offerings. We invite you to explore our agenda and discover the many ways you can partner, sponsor and advertise with us. We at Meetings Int. provide direct exposure for your products and brand. Meetings International Conferences is a global leader in producing high quality conferences, meetings, workshops and symposia in all major fields of science, technology and medicine. Since its inception, Meetings Int.. has been associated with national and international associations, corporations and high level individuals, dedicated to host world class conferences and events. Meetings Int. supports broad scope research and peer review at a broad range of specialists around the world. The key strategic objective of Meetings Int. is to communic	ate science and medical research between academia, and industry. Through inspiring sessions and tons of networking, you will learn to be even more audacious and bold than you are now and free to grow your mind, grow your business, and grow your bottom-line. We can relieve you of the time and resource draining elements of the events that you plan to hold. From planning to coordinating, start to finish; we will be there to ensure you take the accolades for yet another brilliant program. We organize conferences world-wide. All major conferences of Meetings Int. are accredited with Continuing Professional Development (CPD), Continuing Education (CE), and Continuing Medical Education (CME) Credits. 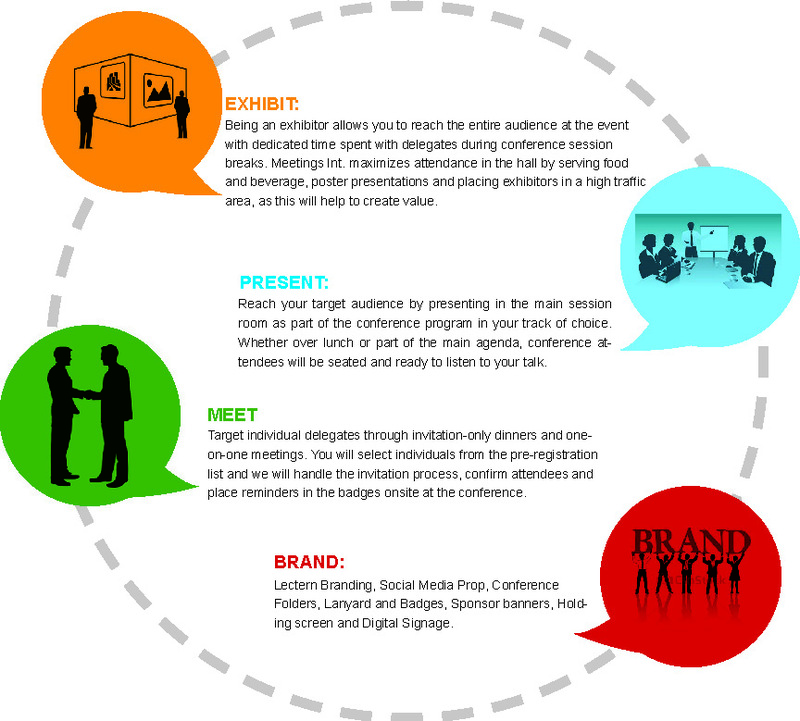 Why to Sponsor @ Meetings International Conferences? Many of our sponsorship and exhibit offerings include extra registrations for your team, logo attribution on our conference and marketing materials, access to the delegate list, and more. You can select from our sponsorship brochure about the package that will not only help you achieve your marketing goals, but accommodate your budget as well.